From the most recent post on a design by Alexander Thomson, we move swiftly on to one by his son. Alexander had twelve children with with his wife, Jane Nicholson, but in 1854 four of the couple’s children (Agnes Elizabeth, Jane Nicholson, George and Alexander John) tragically fell victim to a Cholera epidemic and passed away over a period of three years. This left the Thomson’s with one daughter, Elizabeth Cooper, subsequently the Thomson’s saw their family grow again with the additions of Amelia, Jessie Willamina, John, Helen, Catherine and Michael Nicholson. They had a final son Peter, but sadly he only survived 16 days before passing away. 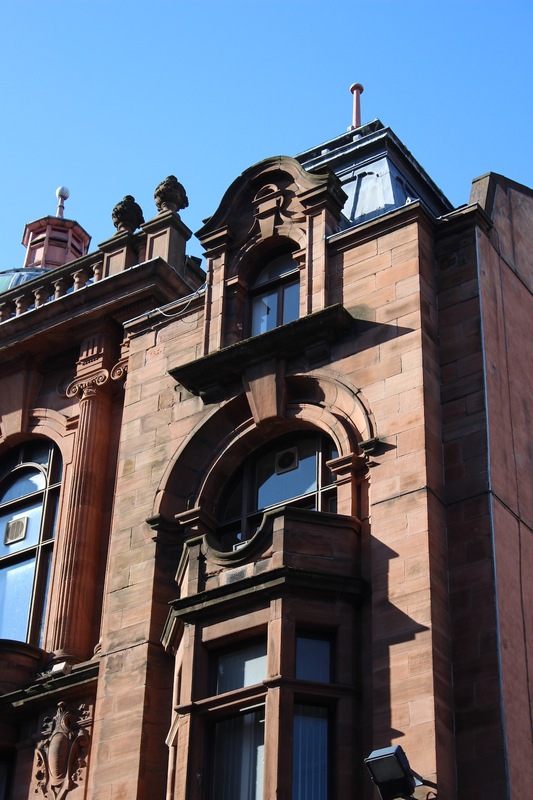 It was Thomson’s eldest son, John Thomson, who was to follow in the family tradition and train as an architect (Jane Nicholson’s father, Michelangelo Nicholson, was also an architect, as was her grandfather, Peter Nicholson). In the month following Alexander’s death John was apprenticed to his father’s practice, Thomson & Turnbull, where his family still retained a controlling interest at the time. Following the end of his five year apprenticeship John moved to London to gain further experience, during this time he impressed and in 1885 won the RIBA Silver Medal with a design for a ‘municipal mansion’. 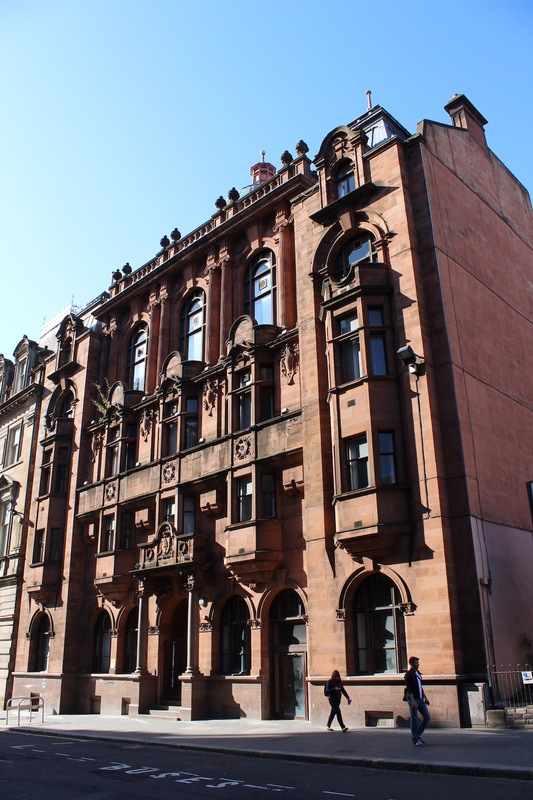 Having proven himself in London he returned to Glasgow in 1886 with the hope of working for his father’s old practice, however he was refused a job. This caused his mother great disappointment (and surely John himself), but it is understood that by this point the Thomson family stake in the practice had been bought out by Turnbull and as such he was under no obligation to reemploy John. Although this initially seems harsh from Turnbull, particularly given he had reverted to using A Thomson & Turnbull as the practice name in 1883 (an unrelated Thomson, David, had joined the practice as a partner following Alexander’s death and is likely to have been the architect John was most influenced by in the practice), by this point it appears the practice was largely involved in designing speculative housing in Lenzie funded by Turnbull himself. The contraction of the scale of the practice’s commissions and the economic pressures brought about by becoming involved in property development were likely to be the reason for John being turned away rather than any more unsavoury reasons. Turnbull even named his son Alexander Thomson Turnbull, which serves to banish any suggestion of resentment between the two families and instead suggests a continuing respect for his ex-partner. Whilst in the year before his death Alexander Thomson described his relationship with Turnbull in a letter to his brother, “Mr Turnbull and I are getting on pretty well”, which for a British man in the 1800’s is probably tantamount to unbridled enthusiasm! Putting this disappointment behind him John, likely backed by family money, set up a practice with Robert Douglas Sandilands entitled Thomson & Sandilands (as you may have noticed there was a pretty set format for practice names during this particular era!). 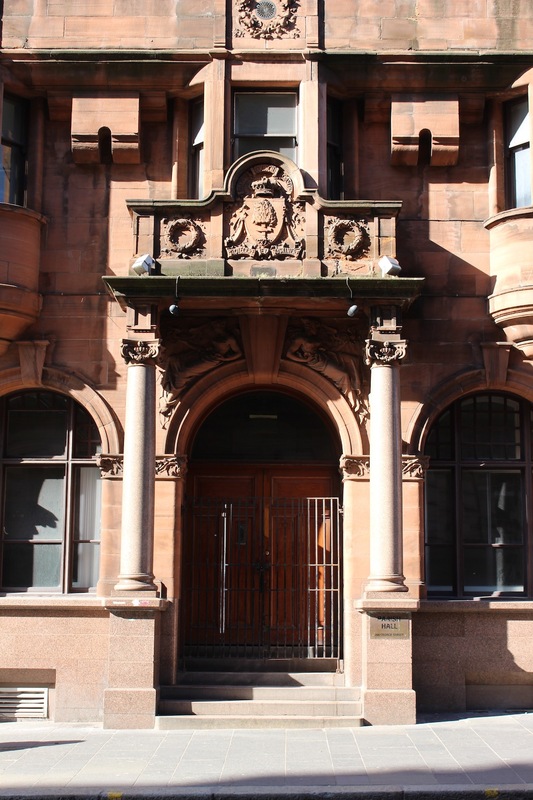 Sandilands had spent five years at the Ecole des Beaux Arts, two years longer than any other Glasgow architect at the time and as such seems to have been credited with much of the design output of the practice. The practice relied primarily on competitions to win work, with one of their most significant commissions coming in 1889 when they produced the winning design for the City of Glasgow District Asylum for Pauper Lunatics (later more snappily titled Gartloch Hospital), which is on my list for a future visit! 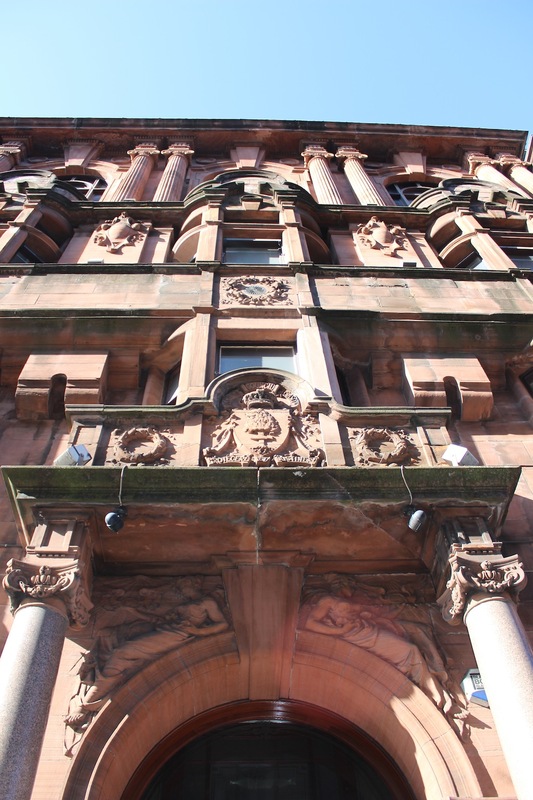 However, this post is on one of their later projects, the Glasgow City Council Parish Halls, completed in 1900. As a former University of Strathclyde student, the proximity of this building to the Union as well as its equidistance between the Architecture Building and Greggs means that I have walked past it on hundreds of occasions whilst paying it embarrassingly little attention. 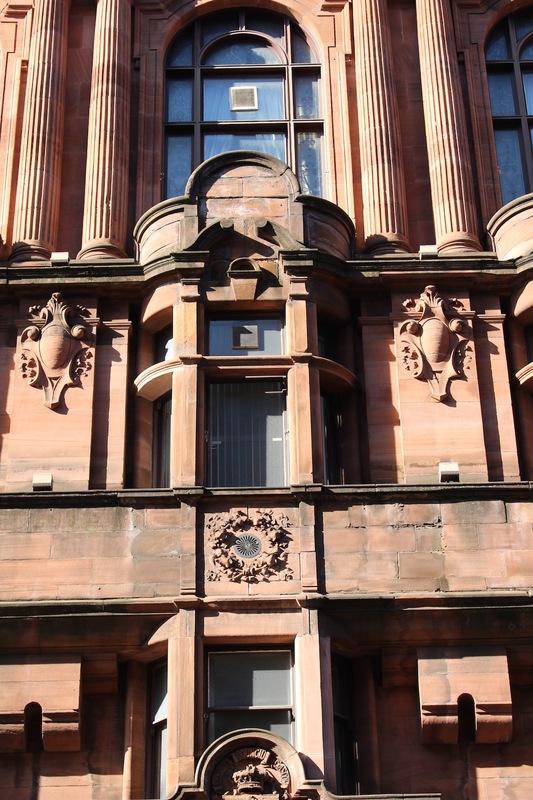 Sitting just off of George Square this building is constructed in red sandstone in an Edwardian Baroque style, with some Beaux Arts touches indicating the hand of Sandilands in the design. It is four storeys with an attic above and five bays wide with the central three recessed behind the street line. At ground level a base course of pink granite rises to cill level then gives way to red ashlar above, where the openings are all round-headed with articulated keystones and simple archivolts that spring from decorative imposts. The entrance is marked out by two ionic columns with quite unusual capitals wherein the volutes are linked by a floral element that passes though them. Behind is an arched entrance doorway with reclining female figures in the spandrel above, as carved by James C Young. Above the porch an elaborate parapet balcony contains wreath carvings with a central motif of an interpretation of the Glasgow coat of arms, however whereas now we would expect to see “Let Glasgow Flourish” below it reads “Protecere et Justinere”, which I have been unable to satisfactorily translate. I assume the intention is for it to translate as Protection and Justice, but I’ve either not been able to find a Latin dictionary that backs that up wholly. I’m sure that there is a root of this that I am yet to uncover rather than a spelling mistake or anything trivial and I’ll hopefully update in due course! There is a progression in window scale which grows from first to third storey in the central section, either side of the middle bay two storey oriels rise from a small and sculpted corbel, they are interrupted halfway by a band of masonry that acts as a false balcony and is decorated with wreaths at each bay. At second floor level the height of the window is increased and a stone transom is introduced, the key stones above these windows are also articulated and the cornice is interrupted by broken curved pediment at the window head. Between each of these windows is a Beaux Arts styled cartouche embellishment is also introduced. The oriels conclude with a semi-circular parapet that serves as a balcony to the third floor windows. At the third storey the scale steps up again with round-headed windows letting light into the hall behind, enlarged keystones and the re-introduction of archivolts around the windows. Thomson and Sandilands also introduce paired ionic columns, but mix styles by utilising a doric entablature above, this Beaux Arts conceit leads the columns to have a slightly odd proportion. Gomme points out that this pairing of columns was almost certainly pinched from fellow Beaux Arts alumni, JJ Burnet’s, Waterloo Chambers (ironically not on the list despite serving as a point of inspiration for those on it, perhaps an oversight!). A heavy cornice topped with a balustraded parapet conceal the attic storey, piers above the balustrade that line in with the columns below carry sculpted urns. Rising above all in the centre is a dome that is almost imperceptible from the street aside from the timber and lead lantern and finial that tops it (the Historic Scotland listing states that the lantern is constructed in ashlar but it doesn’t appear that way). In the outer bays the oriel is recessed with a frame which concludes in an archivolt that encloses a lower round-headed window to the evidently secondary space behind, the semi-circular balcony to this window is the inverse of the central ones. This reduced height allows for an aediculed attic window above which projects above the line of the cornice and concludes with a rounded pediment. The outer bays are then topped with a Frenchified pavillion roof with finials above. As the building is currently out of use I haven’t been able to get access to the interior, however you can see some brilliant examples of photos taken inside here, that highlight the fact that the quality of the facade is echoed internally. The site has been marketed for sale recently and hopefully a purpose can be found for it that allows the original interior features to remain undisturbed. Similarly, hopefully something of quality can be done on the long-dormant site next door that would allow the urban fabric to be completed. This is a building with a really interesting composition and aesthetic style, by a practice with an equally interesting origin story. 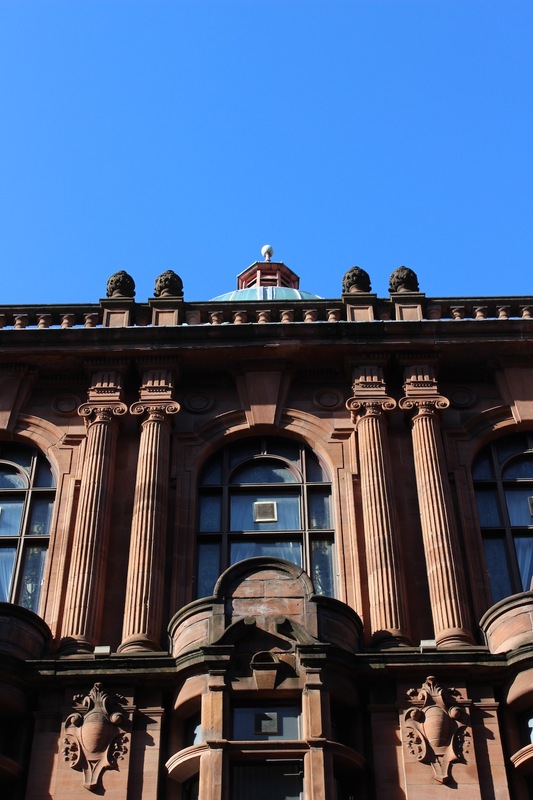 It is also so central that basically anyone who has visited the city will have walked past it or been able to see it from George Square, I hope that next time you pass by you stop and look up! You can find the Historic Scotland listing for this building here. Thomson’s other son Michael also later went on to work at his big brother’s practice for a while, however he went on to become an engineer rather than an architect. I’d be really keen to get a look inside, I’ve noticed that it’s been including in quite a few previous Doors Open Day events so hopefully it’ll be included this year, either that or I could just pretend I am interested in buying it! Sounds a dangerous strategy! Safer to wait for Doors Open….. Gave you a wee mention today. Very much appreciated! You’ve managed to quadruple my average non-new post day views and double my follower count so I’m very grateful! Oh very good! A pleasure.